LAMH PLAYER: Open Beta... Renders and Discussions Thread. 1.5.13 UPDATE READY! 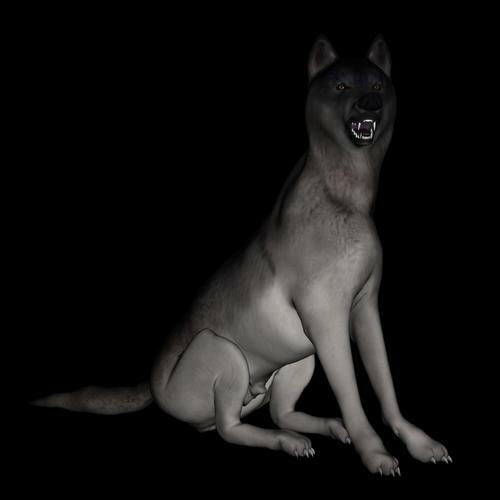 Hello Allesandro and Kendall, I bought Wolf by AM and can not get the furred version to load. The no fur version loads just fine. Was going to use the wolf for some halloween renders. I access content through the content library and I believe the one that is the is furred version is just labeled wolf. When I try to load one line goes by 100% the second line is Wolf.cr2 it gets stuck at 99%. Program becomes unresponsive? And there are no LAMH presets in the smart content. I believe you are trying to load the geometry based fur, which indeed is quite slow to load. and use it with the LAMH Player (or full version). Hello Alessandro, I downloaded some of the free presets that were at furrythings.com. 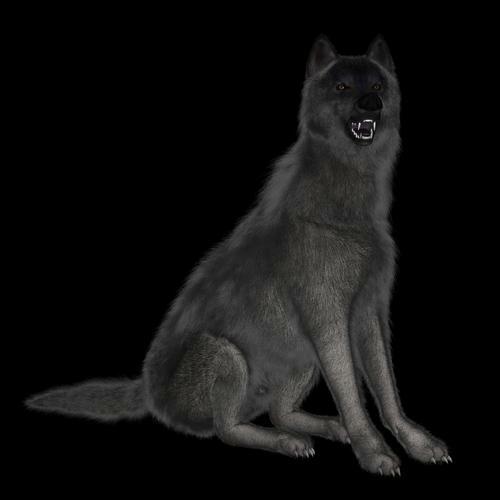 I've been working with the wolf today and I was able to add the fur with the free player. A lot of the presets of colored fur that are in the content library do not work but I was able to use the player to adjust colors to my liking. So far no fatal crashes, no bad duf warnings. Only thing was some shaders I used in the render didn't make it through the save scene process. Something about brickyard severity. Not sure of the messages but overall I'm pleased with the results. I will try to figure out the the shader problem later. Being able to add the fur makes all the difference see attached. Wolf with fur and Wolf with no fur. Very good! If you study a little more how LAMH works, you can easily allow the fur to gather colors from the underlying model. In this case, if you load the texture of your choice on the wolf model, you can select the LAMH Group for the body (through the Scene pane), go to the Surface Pane, and assign the same texture on the Root/Tip color property there; this will tell LAMH to color the fur accordingly on render. I have the latest LAMH player 1.5.13p installed and when i press the ‚clear the screen‘ button to set up a new scene it immediately crashes DAZ studio. This happens always no matter which LAMH based model is loaded and deleting the LAMH group and or object in advance makes no difference. My system is OSX 10.9.5 and DAZ 4.6.3.52. Thanks for the report. Could you please email the LAMH logfile.txt to "[email protected]"? Hi, I have tried the new version of the player. 1) Loading a LAMH preset. Then delete it, and load another preset: DAZ Crashes. 2) Loading a LAMH preset. Then delete Genesis, load a new scene, load another LAMH preset and try to render: DAZ stops the render saying "RENDER ERROR". If I try again it answers:"CAN'T RENDER: RENDERER IS ALREADY IN USE". I just installed the free player via DIM. Some renders work, like the "flat top" preset used on a Genesis figure. The millenium cat renders, but the fur looks very sparse with default settings. And then when attempting to render other hair presets on a Genesis figure, I get the same error as in the post I quoted (#2). 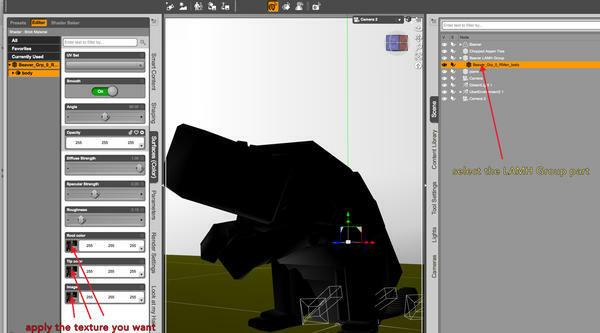 I should add that the "render error" happens the first time a figure is loaded and a hair preset is applied. Then I have to close DAZ Studio to kill the renderer. The update for Iray is in development. That's all fine and good, but what about the render failure I experienced in 3delight? That's why I necro'd this thread. The "render error" can happen for a number of reasons. It is a generic error in 3Delight that is a catchall for an error that is otherwise unclassified. In the past "render error" was primarily triggered by a preset loaded onto a version of a figure where the figure's internal name is the same but the mesh was changed slightly in an area covered by the preset. However, I would need more information than was provided by the post to even hazard a guess. We've not had many reported "render errors" in quite some time, which is why you needed to necro this thread. I just downloaded version 1.5.15 of the free player. It worked fine when I was creating my scene. I'm using the DAZ Squirrel and freebie hair player file for testing. Got everything added and rendered and it worked great. But I don't like the 3Delight renderer, so I exported to OBJ. Now it seems that every time I try to do anything in the scene, it crashes DAZ 4.8. I'll play around some more and see if I can duplicate the steps and let you know where it's dying. But it's not been consistent so far. is it possible to export figure with the fur (to 3dxchange)? but in 3dxchange its "bald". What am i doing wrong? 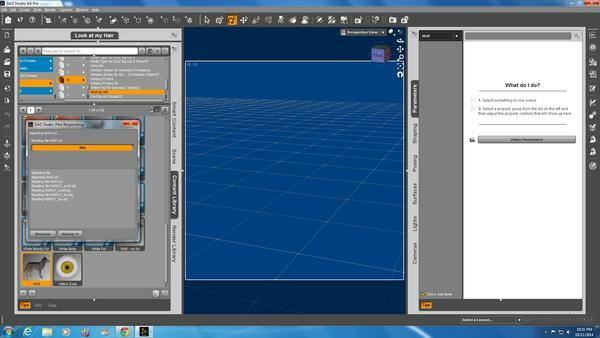 Export it to obj or Fibrehair, but I guess this wont work in iClone. Far too high poly. Okay, I'm feeling like a complete moron here; I've downloaded the free player, copied over the unzipped files, restarted DAZ, and I'm still not getting the pane option, 'Create' option, NOTHING. I'm running DAZ 4.8 Pro, anyone got a fix? I know, that's what I'm NOT getting when I installed the plugin. I've restarted DAZ twice, and I'm not getting a thing! Nope, just the one version of DS, tried uninstalling then re-installing LAMH, and still bupkis. Trying to install LAMH Player manually is really likely to be a problem. Have you tried using the DIM to install? That's what I was doing, installing with the DIM. I just downloaded and Installed the free player through the DIM Manager, however how do I access it through Daz Studio 4.8? 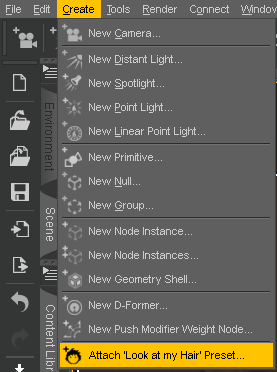 its activated in plugins however I see no way to actually navigate to the actual thing. The player can be accessed via Window->Panes (Tabs)->Look at my Hair or via Create->Attach 'Look at my Hair' Object. The green lines are the LAMH preset. Those are the guides. If you render with 3Delight, those will become fur.